Plans to build a fish farm along a popular stretch of South African coast prompted concerns Monday that it could entice sharks, endangering tourists and Iron Man triathletes. 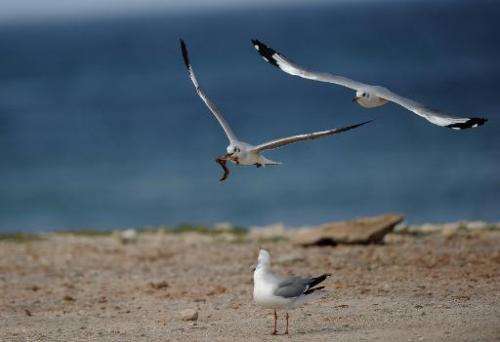 Authorities in the Indian Ocean beach town of Port Elizabeth say the vast fishery 2.5 kilometres (1.6 miles) off the popular Hobie Beach will create much needed jobs. But assorted beachfront hoteliers, marine biologists and local councillors say the project would also attract Great Whites and other sharks found in South Africa's icy waters. Ironman South Africa director Paul Woolfe told AFP that if the project goes ahead they will be forced to move the event to another city. "One of many risks is that our athletes might be eaten by sharks, because the fish farm will lure bigger sharks to the bay that are not normally there," Woolfe said. "The area the project is envisaged for is where the athletes train during the night" for the swimming part of the triathlon, he said. "We cannot risk them." He said Ironman SA had already been contacted by the cities of Cape Town and Durban about hosting the race. He claimed Port Elizabeth could stand to lose around eight million dollars (6.4 million euros) in revenue if the race moved. Port Elizabeth is slated to host the annual Ironman African championship—a 3.8-kilometre (2.4-mile) swim followed by a 180-kilometre (112-mile) bike ride and a marathon run—until 2016. The Department of Agriculture, Forestry and Fisheries has already granted authorisation for the fish farm to go ahead, while a petition has been launched to stop it. Dean Biddulphs, a municipal councillor, said the farm was important for jobs but should be built on land. "If it's land-based, it's even more economical and cost effective," he said, adding that there was land available nearby. If the venue were left unchanged and they managed to get some sharks, think of the notoriety. Lots of attention, followed closely by lots of corporate interest keen to have an audience for their products. I'd suggest the commemorative t-shirt (or whatever article of clothing) read "I survived Ironman South Africa with most of my limbs intact".